For my card I used Tiddly Inks – Take Me Away. I coloured the image with Copics. I added Sparkle to the bubbles with Stickles, Glossy Accents, and gems. I added two strips of gold foil ribbon. The sentiment is from Kaisercraft. The diecut is from MFT. I would like to thank our weekly sponsors who generously provide our wonderful prizes! Hello everyone. I was invited to be a guest designer for the month of June by the DT team at Outlawz. You can join for free! 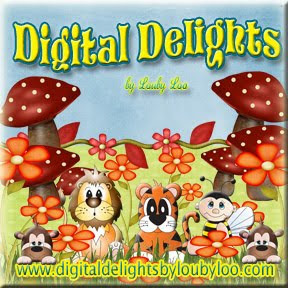 They have a fabulous blog – full of challenges, tutorials, forum, freebies, gallery and more. I am designing for their Thursday Twist Challenges. This challenge is “open” with a added twist each week. This week’s Twist is “Fun in the Sun.” I designed two different cards for this challenge. Click on the link below to find out more about this fabulous group, The Outlawz Challenges. I made two cards for this challenge. 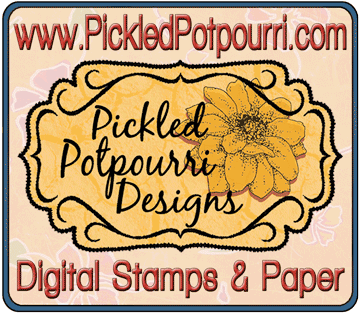 This month’s sponsor is Whimsy Stamps. Card 1: For my first card, The sentiment is by Whimsy Stamps, called “Vintage Sentiments.” This is my “Go To” for digital sentiment stamps. There are 14 general script sentiment stamps with this file. I used an adorable Bugaboo (retired) stamp called, “Sumduckdive.”. I coloured him with Copics, fussy cut him out and set aside. Next I arranged the layout and using Sun die from MFT - SUN, MOON & STARS, and the wave and fish dies from Marianne Designs - Eline’s Whale and Eline’s Tropical Fish. I assembled the card using glue and dimensionals and added some gem bubbles for the finishing touch. For my second card, The sentiment is by Whimsy Stamps, called “Vintage Sentiments.” This is my “Go To” for digital sentiment stamps. There are 14 general script sentiment stamps with this file. I used an adorable Bugaboo (retired) stamp called, “Sumduckswim.”. I coloured him with Copics, fussy cut him out and set aside. Next I arranged the layout and used the wave, fish, and plant dies from Marianne Designs - Eline’s Whale and Eline’s Tropical Fish. I assembled the card using glue and dimensionals and added some gem bubbles for the finishing touch. Please check out all the rubber and digi stamps Whimsy Stamps have to offer. They have a fabulous selection of both Sentiment and image stamps that will add to your crafting! Hello everyone. I was invited to be a guest designer for the month of June by the DT team at Outlawz. You can join for free! They have a fabulous blog – full of challenges, tutorials, forum, freebies, gallery and more. I am designing for their Thursday Twist Challenges. This challenge is “open” with a added twist each week. This week’s Twist is “Anything Goes.” I designed two different cards for this challenge. Click on the link below to find out more about this fabulous group! I made two cards for this challenge. To learn more about Whimsy Stamps, click on their logo below. A couple of months back. I took a class with Heather Telford. She is on the Design Teams for both Penny Black and Darkroom Door. She showed us how to create beautiful and colourful backgrounds using Distress Ink Stains on watercolour paper. These are the cards I made at home. The stamp sets are from Darkroom Door - Background Stamp – Tribal and Rubber Stamp Set – African Trees. I stamped the images first and let dry for five minutes. Next using a wide brush and plain water I wet the paper surface. Next using the same brush I blending various shades of yellow, orange and red. Once dry, I glued image to the card base and added a sentiment. Please join us and check out our sponsors who generously provide us with our fabulous prizes. 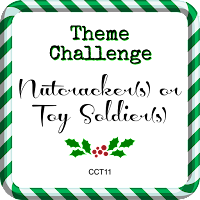 I love this challenge because I challenged myself to make a Christmas Card designed specifically for a boy. I used Tim Holtz’s Christmas Stamps. Their were 4 stamps in this group: tree, snowman, toy soldier, and snowflake. Note: You can also buy them as individual stamps. I stamped and coloured the soldier 4 times. I used the dull image for the base and inked the areas around the soldier with various brown distress inked. The actual soldier, I coloured with Copics. I then fussy cut his head, hat, gloves, boots, and crossed embellishments and layered them on the base using foam dimensionals. I also distressed the card stock around the toy soldier image and added amber gems and natural twine. Please let us help you get your Christmas card stash going. Hope to see your cards!